Direct bolt-on brake hoses bring the ultimate in braking performance. They improve your braking performance for competition or everyday driving. 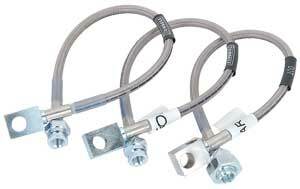 Replacing the OE rubber hoses with Russell brake hoses reduces brake hose expansion for more consistent braking. Featuring stainless steel braided hose with zinc plated fittings, these brake hoses are factory assembled for convenient installation. They meet the guidelines of the U.S. Dept. of Transportation FMVSS-571.106 requirements. All of these Russell brake hose kits are for stock applications unless noted otherwise. Does Russell 692030 fit your vehicle? 692030 is rated 3.0 out of 5 by 1. Rated 3 out of 5 by Engine Man from The front hoses where a little short ,the rear fit as it should. I would purchase this product again.